Windows 2008 (the non R2 version) was built on the Vista operating system, and has some quirks that other Windows versions do not. Internally the Ctr-Alt-Del operates in a different way, and requires a work around to be able to get past it to login from RemoteToPC. The workaround is to use the on-screen keyboard to enter the key combination. 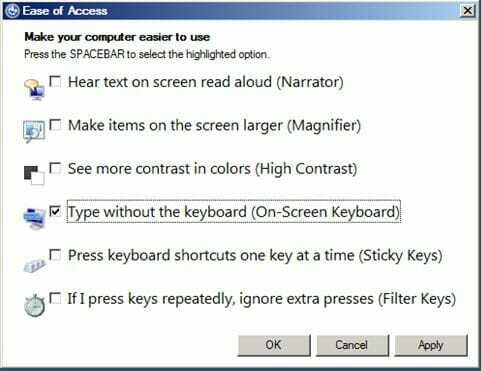 Click the ease of access button on the bottom left of the screen, select to view the on-screen keyboard, and click the Ctr-Alt-Del from there. A fix for this issue on 2008 systems is to download the Windows 7 version of the Microsoft Windows Software Development Kit (SDK) , and put the Sas.dll file in your C:\Program Files(w32)\RemoteToPC\host folder. Put these lines into a text file name “remove-cad.reg” Save it and double click the resulting file to merge the information into the registry. Reboot to see the effects.